With patented anti-slip system: the Genux remains in place all day. The Genux knee orthosis (also known as knee brace or knee splint) is one of kind. The unique concept of this orthosis allows for accurate and individual support, matching the specific needs of its user. In addition, the orthosis is provided with the patented anti-slip system. As a result, the Genux does its job well and comfortably throughout the day. The Genux is used in cases where genuine support of the knee is needed, for example, in case of a valgus– or varus instability of the knee or at first stages of knee hyperextension. In order to provide functional improvement in those cases, a knee orthosis must be able to generate high level forces. The Genux is capable to do so. A worn-out knee… then what? Osteoarthritis (OA) of the knee joint is a common condition generally referred to as ‘worn-out knee’. Osteoarthritis can occur in all joints of the body, including the knee. Osteoarthritis occurs roughly twice as often in women as in men. The chance to get this condition increases with age. The knee is the largest joint in the body and very important for standing and walking. The consequences of osteoarthritis can be serious. Chronic pain is frequently reported. Also, instability of the knee occurs a lot. The knee then gives way into an x-position (valgus) or in an o-position (varus). Your complaints could become so severe that you need a knee orthosis (also known as brace). Due to the stable build of the Genux, it is also used for a starting hyperextension (overstretching) of the knee. This occures for example, on people with hypermobility or the Ehlers Danlos Syndrome (EDS). The Genux is then a slim lightweight orthosis that can stabilize the knee so that it does not get into the painful overstretch. Questions about the knee orthosis? Please contact us. The Genux is intended for people with knee instability in valgus or varus. At a valgus (x-position) the knee drops relative to the ankle and hip inwards (seen from the front). In a varus (o-position) it is the other way around. The Genux helps to compensate this, and this usually leads to a quick improvement in the stability and reduction of complaints. This instability can be caused by osteoarthritis, which causes too much joint clearance due to degeneration of cartilage. Usually, on one side of the knee, it is worse than the other. Because at the most affected side the most cartilage is disaperead, the knee just drops that way. At a valgus the lateral (outer) side of the knee is most affected and the knee is lowered more so that an X-position of the knee is created. For varus it’s just the other way around. As a result of the skew, the load on the affected side of the knee is also increased, which only makes the problem worse. Treatment is then necessary to restore the knee functionalities, reduce pressure on the most affected side, eliminate instability and ultimately reduce pain. Sometimes the instability of the knee is not caused by loss of cartilage, but through torn knee ligaments, usually caused by a trauma, for example due to sport, or a car accident. Through torn ligaments, the knee can lose its intrinsic stability. For some, the muscles can catch it a bit, but not more than a little. To prevent the knee (ligaments, joint capsules, tendons) to be further damaged, it is sometimes necessary to wear an orthosis that can take over the frontal stability of the knee. The Genux is excellently capable of stabilizing an unstable valgus or varus of the knee. Sometimes the knee ligaments are still intact, but they are just weak or stretched too much. This occurs at people with hypermobility complaints (eg Ehlers Danlos Syndrome, EDS). Also in those cases, an orthosis is sometimes needed to increase the functionalities of the knee by taking over the lateral stability with an orthosis. Sometimes the lateral instability of the knee is doable, especially because, as indicated, the muscles can help a little, but the main complaints arise from (an initial) overstretching knee. This can cause a lot of pain and irritation. On top of that, an untreated overstretching is getting worse, because at each step the ligaments again become a bit more stretched. The Genux is well-equipped thanks to the built-in extension plug in the knee joint and the long stable structure, which is also able to stabilize the knee in extension. This prevents aggravation of the hyperextension and increases the functional ability of the knee. With the Genux we can also fortunately stabilize a valgus ánd a hyperextension. The orthosis is strong enough to provide high stability, even in case the instability is big. Wordt met name de hyperextensie erg groot, dan adviseren we op een gegeven moment om een UTX-POST te overwegen. Deze Ambroise orthese is nog beter in staat om ook bij wat ernstiger hyperextensies goede stabiliteit aan lichtgewicht draagcomfort te koppelen. Bovendien zien we vaak dat er bij ernstige hyperextensies toch wat meer aan de hand is dan alleen maar een overstrekking van de knie. Met de UTX lijn kunnen we meestal ook die andere aspecten goed ondersteunen. In particular, if the hyperextension is very large, we recommend at one point to consider an UTX POST. 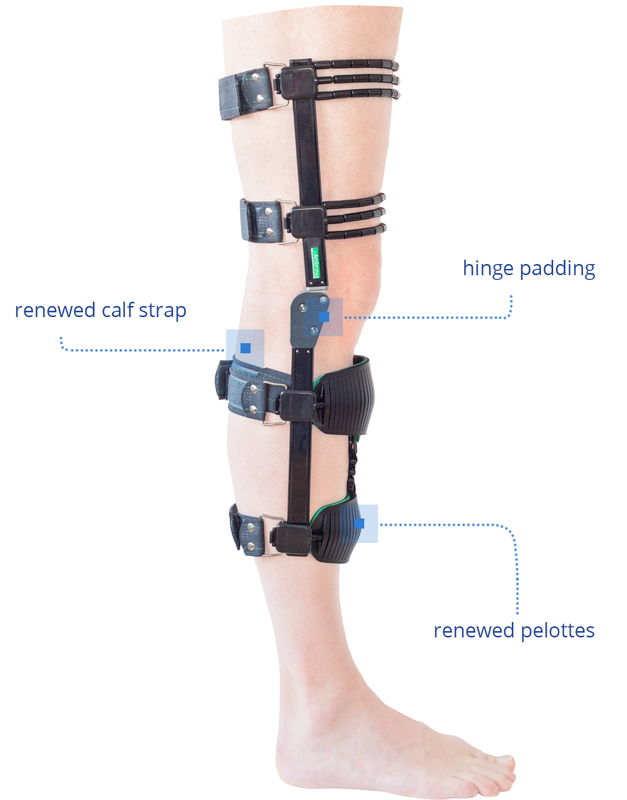 This Ambroise orthosis is even better able to connect good stability to lightweight wearing comfort even with more severe hyperextensions. In addition, we often see that in severe hyperextensions, something is more than just a knee overhaul. With the UTX line, we can also support those other aspects. The Genux can, depending on the use, the adjustment and the degree of instability of the leg, exert significant corrective forces. Therefore, be careful with hypersensitivity to skin pressure. For people with poor blood circulation, it is advised to discuss the use of the Genux with the attending physician. The Genux calf band is more or less a circular band, that in such clinical situation may not be advised. In this video you can see how to open and close the strap clips of the orthosis. In this video you can see how the orthosis is put on. For more videos about using the Genux, you can visit our YouTube channel. How does the Genux work? The Genux is specially developed for use for people with severe complaints due to knee osteoarthritis. It is a lightweight orthosis that is custom made for you. The Genux stabilizes and corrects the affected knee. The frame of the GENUX prevents the knee from bending too much in valgus or varus by offering back pressure on the leg. This reduces the load on the knee at the affected side: less stress is on the knee side where the cartilage is most affected (and slightly more on the other side). As a result, the pain is usually reducing. he cable can absorb very high tensile forces, which arise when the leg is loaded in the frontal plane in valgus. This is how the lightweight frame by adding a string of a few grams can suddenly stabilize a valgus knee. With the Genux the leg comes again in a more natural position. This also usually creates a more natural and more efficient gait pattern. This makes the Genux a functional orthesis. Renewed pelottes The new pelottes are less prone to breakage, mounted more securely and cover off the pelotte carrier front better. And last but not least: they look better. Hinge padding A nicely looking and perfectly tailored soft padding on the hinge prevents damage to clothes and furniture when you bump against the hinge. With every knee bending the skin stretches. Together with the patella (kneecap) it slides smoothly over the leg down. This video shows that the orthosis allows the skin to move freely thanks to the rolls. The stripes show that this is about 4 cm! Why do knee braces slip down? That a knee orthosis may not slip down may sound like an open door. Nevertheless, it is less obvious than many people think. Slipping down knee braces is one of the most commonly heard complaints in these facilities. Ambroise has developed a unique patented anti-slip system for knee orthoses. We got there by repeatedly asking how the knee braces actually slipped. The widely used braces are usually not so heavy and have more than enough rubber and velcro ties to stick well to the skin. Nevertheless, they slip off. However, ‘sticking to the skin’ is more a disadvantage than an advantage, if you know exactly what our skin actually does while bending the knee. Just look at the video on the right. Dan kunt u zien dat bij iedere kniebuiging de huid wel tot op 4 cm kan migreren (bewegen). Then you can see that at with every knee bend the skin can migrate (move) up to 4 cm. By avoiding these skin movements, you create a situation where the skin draws down the orthosis with each bend. Eventually that will work out and the brace has slipped off. The video here next to shows one of the first prototypes of the Genux. The rolls on the upper leg are located around the three arcs placed above each other.Just under the knee is a calf strap. This calf strap has an elastic that runs to the lower arch of the Genux (just above the ankle). This is how the Genux is attached to the calf band. Because the rolls allow the skin to move up and down easily under the Genux, the knee bending does not pull the orthosis downwards. The calf strap keeps the Genux in its place. The Genux itself can make, thanks to the elastic, micro-movements up and down and the skin can migrate freely below the Genux. Those three elements (the rolls, calf band and elastic) make sure the Genux does not slip down.